We’d love your help. Let us know what’s wrong with this preview of The Orphans of Race Point by Patry Francis. Set in the close-knit Portuguese community of Provincetown, Massachusetts, The Orphans of Race Point traces the relationship between Hallie Costa and Gus Silva, who meet as children in the wake of a terrible crime Set on Cape Cod, Massachusetts, a suspenseful page-turning saga of love, murder, and the true meaning of faith from the author of the acclaimed The Liar’s Diary. To ask other readers questions about The Orphans of Race Point, please sign up. At nine years old Hallie becomes the soul mate and lifelong love of a emotionally devastated Gus, a transformative and unconditional love. These two motherless children would bond and become a sounding board for their futures, wherever that would take them. Such a hard but beautiful story, a story that highlights the good and the bad in us all, that shows the many different sides of the same person. Tragedies, so many things the characters in this book had to overcome, and yet there was little d At nine years old Hallie becomes the soul mate and lifelong love of a emotionally devastated Gus, a transformative and unconditional love. These two motherless children would bond and become a sounding board for their futures, wherever that would take them. Such a hard but beautiful story, a story that highlights the good and the bad in us all, that shows the many different sides of the same person. Tragedies, so many things the characters in this book had to overcome, and yet there was little doubt that they would be overcome. I loved it, and immediately gave it to a friend to read. Most surprising to me, is the fact that I have not seen much publicity for this book. I read about 3-4 books a week, and sometimes they just seem to blend together, or just aren't that interesting. This one is great...something new....long, but not so long that you wish it could be over....takes your emotions and twists them...leaves you feeling something for each character, be it dislike, sympathy, sadness, frustration....You will not be I loved it, and immediately gave it to a friend to read. Most surprising to me, is the fact that I have not seen much publicity for this book. I read about 3-4 books a week, and sometimes they just seem to blend together, or just aren't that interesting. This one is great...something new....long, but not so long that you wish it could be over....takes your emotions and twists them...leaves you feeling something for each character, be it dislike, sympathy, sadness, frustration....You will not be ambivalent about any of the characters in this book. I predict that this will soon be a book club selection. I feel that I have "discovered" this book, and am so excited to suggest it others. Can't wait to read what others have to say about it. How can I write a review that does this book justice? I could not put this book down. The characters just came alive from the moment I started reading and are going to be with me for a long time to come. This book is absolutely in the top 5 books I have ever read. I think I am the odd man out here after looking at other reviews. Honestly this was more like a 2.5 star read. It was ok and a few parts I did enjoy. I will be interested to see what my buddy readers think of this. It started out good I thought. I was enjoying and liking the characters. For me, it started to go downhill after the first major "event." So many things happened. So many things that I couldn't imagine ever really happening. I admit I am more critical of books that are supposed to be I think I am the odd man out here after looking at other reviews. Honestly this was more like a 2.5 star read. It was ok and a few parts I did enjoy. I will be interested to see what my buddy readers think of this. It started out good I thought. I was enjoying and liking the characters. For me, it started to go downhill after the first major "event." So many things happened. So many things that I couldn't imagine ever really happening. I admit I am more critical of books that are supposed to be "real." In fantasy I experience all kinds of characters doing all kinds of out of this world stuff. I enjoy that and craziness and unexpected turns are well...expected! In a contemporary fiction, for me at least, I need to "believe" it might actually happen. Now, if it were funny, then zany things can also be acceptable...that's part of the magic. Or if there is supposed to be magical realism. This was however a serious story and so many times I thought..."seriously?" Even though there were a lot of twists and turns....it became formulaic. I almost felt like, "well of course that happened." Subplots that should have been excised, characters who never should have existed. Overly ambitious--and not in a good way. “Set in the close-knit Portuguese community of Provincetown, Massachusetts, The Orphans of Race Point traces the relationship between Hallie Costa and Gus Silva, who meet as children in the wake of a terrible crime that leaves Gus parentless. Their friendship evolves into an enduring and passionate love that will ask more of them than they ever imagined. When you want to build a fire on the windy beaches of the Outer Cape, it’s best to start slowly; to protect a small pyre of driftwood twigs with your cupped hands and let the salt air funnel though them to ignite the spark. You shield it from the gale while funneling the buffeted channels of sea air as they swirl and the twigs catch fire; then slowly feed it until the flames are free to dance higher against the wind before settling into a crackling bed of hot red coals that warm the shore. This is what reading The Orphans of Race Point felt like to me. With this story Patry Francis has carefully constructed a story with arcs and lulls leading to a satisfying conclusion. As a thirty year ‘wash-a- shore’ my initial interest in this book was purely geographical – the publisher’s synopsis didn’t really pique my interest all that much. I requested an Advance Reader Copy to see if the author captured the essence of the area and was curious to see how much of a part, if any, Cape Cod had in this novel. What I found was that the Cape is a character in this book; its influence shaped who the other characters are- just the way it does the life of anyone who lives here - and I cannot imagine this story taking place anywhere else or how these characters could have developed in any other cultural setting. This is not to say that they are constricted by their location, but rather their personalities are authentically deepened by the richness of the community Patry portrays. From the first section of what I thought was going to be a romance novel, Patry Francis has created a landscape of memorable, multidimensional characters who tell a “who done it” mystery laden with love, pain, fear, betrayal, and hope as their own, and you don’t doubt them for a moment. Because they have been so richly nuanced, the reader’s insight into each of the three speaker’s motivations allow them to propel their intricately woven story lines forward with realism and recognition. The Orphans of Race Point spans decades in the lives of its two main characters, Hallie Costa and Gus Silva ( both familiar surnames in PTown) and the events that lead to the introduction of the third, Mila, many years into the story. Through a series of horrific events fueled by violence, alcohol, jealousy and deceit, our three protagonists manage to find faith, friendship, love and ultimately peace in what turns into a quest for truth and justice. Given my luke-warm response to the synopsis, and the fact that I’ve not read Francis’ first book, I had no expectations of The Orphans of Race Point. What I discovered was not just a mystery, not just a love story, not just an exploration of how a person’s perception of events shapes his life, not just how inner strength and love can help overcome obstacles, not just how acceptance is as big a part of love as passion, but all of the above. My thanks to Harper Perennial for forwarding this ARC. I’ll be gifting this one when it’s published. The Orphans of Race Point by Patry Francis spans several decades in the lives of Gus and Hallie. It seems at first to be a love story, but it turns out to be much more than that. It covers many topis includ When Gus Silva is a boy, his father who is known for his temper kills his mother in a rage. Gus, who was home when it happened, stopped talking. Only Hallie Costa, the local doctor's daughter could break his silence. Years later, they fall in love. But another act of violence tears them apart. The Orphans of Race Point by Patry Francis spans several decades in the lives of Gus and Hallie. It seems at first to be a love story, but it turns out to be much more than that. It covers many topis including friendship, love, religion, abuse, deception and forgiveness. The characters and their relationships seem genuine, and the storyline goes in unexpected yet realistic directions at times. The story is told from a few different points of view, but each character has an entire part of the book, consisting of several chapters, so the alternating voices are not distracting. I also found that I was able to connect with each character very well because of this style. And it helped with the flow of the storyline as we were able to see how different characters spent the same portion of time, without having to jump back and forth between those characters' stories each chapter. I personally loved the setting on Cape Cod, mostly in Provincetown. I grew up in Massachusetts (on Nantasket Beach, which is also mentioned in the book) and have been there many times. Francis definitely got the feeling of that setting down in this book. It's clear she's been there many times as well. I was sucked into the heavy emotional vortex and suspense of this tragic love story. Nothing draws on my emotions causing great angst than a story depicting a person wrongly accused of an affront let alone a heinous crime. The tension builds as the story unfolds and I was having to remind myself this is a 'story'....relax. Hallie and Gus wrap themselves around your heart and you keep thinking... IF only ONE night played out differently. Gus is such a compassionate soul but...a few of his choic I was sucked into the heavy emotional vortex and suspense of this tragic love story. Nothing draws on my emotions causing great angst than a story depicting a person wrongly accused of an affront let alone a heinous crime. The tension builds as the story unfolds and I was having to remind myself this is a 'story'....relax. Hallie and Gus wrap themselves around your heart and you keep thinking... IF only ONE night played out differently. Gus is such a compassionate soul but...a few of his choices were ridiculous and I felt utterly implausible. Despite my hesitancy I still found myself taken by his overall character and heart leaving the implausible whittled to a 'maybe.' The sage connection these two share is magical, unquestionably they compliment each other before their own realization awakened them. Divided by events, two hearts, two souls bound together forever. Mila my heart bled for her, compelling, ladened, fiery, a strong young lady given her circumstances. I also found Patry's absorbing plot very creative and individual. At first I was skeptical on the premise, as more of the story was explained I was impressed by her unique ideas and innovative foundation. Weaving the ethnic thread of a town and its community and culture was well done, added a layer of warmth and ambiance. The emotional burden of friendships and events was impeccably explored. Although predictability hung in the air, I believe most won't find this to be an issue. I just happen to be ultra skeptical, lacking trust and read between the lines than most. A narrative not only encompassing a tale of a tragic love story but a narrative full of suspense, ultimate betrayal, envy, change, family and love revealed through three distinct characters over several decades. Patry skillfully expresses the voices of the three main protagonists. Clearly the protagonists motivations, memories and thoughts are undoubtedly stated so the depth of love and love of family is clearly felt through soulful prose. Ms. Francis claimed me as a fan with her first book, THE LIARS DIARY so of course I looked forward to her next book. The wait was well worth it as ORPHANS OF RACE POINT far exceeded my expectations! What a wonderful follow up! After nine year old Gus Silva is orphaned when his abusive father kills his mother, the boy is haunted most of his life by grief and guilt. Only with the assistance of widower, Dr. Nick, and his daughter, Hallie Costa, a classmate of his is he pulled out of his catatonic depression. In high school Gus becomes a star football player full of charm. He and Hallie finally admit their lifelong love for each other. A tragic incident at a beach party leaves Hallie seriously injured, and Gus’s guilt leads him to the priesthood. Even as a priest Father Gus is drawn into a violate situation that leads to his wrongful conviction for murdering Ava Celinto who sought his help from her abusive husband. The third person narrative spans decades and ends with the person account of Mila Cilento, Ava’s daughter searching for the truth. This heart wrenching novel is a testament to Ms. Francis’s skill and understanding of life, her characters and their diverse paths. This is an uplifting story of murder and betrayal and the magic healing of faith, family and love! Hallie Costa befriends Gus Silva when they are nine years old, after Gus' alcoholic and abusive father murders his mother. Hallie gets Gus to open up in ways no one else had been able to, and they begin their friendship which turns romantic when they are teenagers. On the night of their high school prom, a terrible tragedy devastates their relationship and profoundly alters the course of their lives. And when, a decade later, Gus—now a priest—becomes entangled with a distraught woman named Ava a Hallie Costa befriends Gus Silva when they are nine years old, after Gus' alcoholic and abusive father murders his mother. Hallie gets Gus to open up in ways no one else had been able to, and they begin their friendship which turns romantic when they are teenagers. On the night of their high school prom, a terrible tragedy devastates their relationship and profoundly alters the course of their lives. And when, a decade later, Gus—now a priest—becomes entangled with a distraught woman named Ava and her daughter Mila, troubled souls who bring back vivid memories of his own damaged past, the unthinkable happens: he is charged with murder. Can Hallie save the man she’s never stopped loving, by not only freeing him from prison but also—finally—the curse of his past? I fell in love with Patry Francis's writing when I first discovered her blog, Simply Wait, many years ago. In her latest novel, THE ORPHANS OF RACE POINT, her poignant take on the human condition rings true once again. From the moment the main character, Hallie, is introduced as a precocious and determined young girl in a shore town on Cape Cod, the reader knows this story is going to dig deep, and possibly hurt. Many characters in this book are orphans, and the different circumstances that dete I fell in love with Patry Francis's writing when I first discovered her blog, Simply Wait, many years ago. In her latest novel, THE ORPHANS OF RACE POINT, her poignant take on the human condition rings true once again. From the moment the main character, Hallie, is introduced as a precocious and determined young girl in a shore town on Cape Cod, the reader knows this story is going to dig deep, and possibly hurt. Many characters in this book are orphans, and the different circumstances that determined their orphan status were so complex and challenging that even the adults of the tight-knit, primarily Portuguese, community of Race Point have a hard time coping with their impact. Determined to navigate their own way through the tragedies their lives have become, many of the characters are forced to face potentially disastrous outcomes as they decide how best to honor--or deny--their loyalties to each other and those who love them. Absolutely stunning from start to finish. It was filled with words that begged to be read again because they felt like poetry. A beautifully woven story with big moral messages about love, forgiveness, and redemption. The plot twists? I never saw them coming. Definitely a best book of 2014 for me! 4.5 stars. Excellent story. A bit long for me at 520 pages, but I was glad I stuck with it. It had some unexpected twists at the end, I never saw coming. Great characters you get to know well as they grow into adulthood. I highly recommend! Almost exactly a year ago, I read an early copy of Anthony Marra's The Constellation of Vital Phenomena and was so knocked out by it, I told anyone who would listen (and even some who wouldn't) to read this book. I was so thrilled when it began to get great buzz and win many awards. Reading Patry Francis' The Orphans of Race Point made me feel the same way. From the very first page, I fell in love with the story and the writing and the characters. Reading it, I was lost in the pages, and when peo Almost exactly a year ago, I read an early copy of Anthony Marra's The Constellation of Vital Phenomena and was so knocked out by it, I told anyone who would listen (and even some who wouldn't) to read this book. I was so thrilled when it began to get great buzz and win many awards. Reading Patry Francis' The Orphans of Race Point made me feel the same way. From the very first page, I fell in love with the story and the writing and the characters. Reading it, I was lost in the pages, and when people spoke to me, I did not hear them. I wanted to race through it, yet at the same time savor this incredible story and not have it ever end. It begins in 1978, with nine-year-old Hallie Costa, whose mother died tragically in a drunk driving accident and whose father is the town's beloved doctor, willing to help anyone in anyway he can, whether medically or assisting them with a family situation. Her father is called to a neighbor's home where a woman was murdered by her husband and their nine-year-old son Gus had been found catatonic in a closet. It was thought he witnessed the murder of his mother, but he was too traumatized to talk. Hallie's dad Nick went to visit Gus, and after a five hour staring contest in which Nick "looked into Gus' sorrows and he looked into" Nick's, Gus spoke his first words in weeks- "I give." Hallie and her friend Neil, who was Gus' best friend, visited Gus every day, and Hallie came up with the idea of reading David Copperfield to him. She thought the story of an orphan who mades good might inspire Gus. By the time they are in high school, Gus has become a football hero. He and Neil are still best friends, and Gus and Hallie have fallen in love. An incident happens at a beach party, and Gus' turbulent past plays a part in it, changing the three friends' lives forever. Fast forward and Gus has become a priest, Neil is an actor and Hallie is a doctor like her dad. Father Gus is approached by a woman who has been beaten by her husband and asks for his help. Father Gus advises her to get away from her husband and offers to help her, but the situation escalates and Gus is convicted of a murder he did not commit. This amazing story has so many compelling elements to it- there is the murder mystery, the love story and the true meaning of faith, friendship and family. The way it deals with faith and family also reminded me of Jennifer Haigh's gorgeous Faith, with its story of a priest mistakenly accused of a crime. The family that Hallie creates with people who are literal and figurative orphans is a beautiful one, and shows us that you don't need to be related to truly love someone deeply. Like Constellation, Francis weaves her story elements together to a surprising conclusion. I did not see it coming in any way, and was as blindsided just as much as the characters were. The writing is lovely and the characters Francis creates are so real, I wanted to reach out to these lost souls. I don't know who I could call my favorite- Hallie _"dutiful on her dad's side, unruly on her mom's side", Gus, who cared deeply for his flock and yet led a tortured life, or "misfit princess" Mila, the murdered woman's daughter. There are too many powerful scenes to choose a favorite- Hallie reading to young Gus, Mila visiting Gus in prison, Hallie ministering to her ill father, Nick's talk with Gus at the cottage- they all just touched my heart in a profoundly unforgettable way. Wonderfully written and easy to relate to the characters. Fast read because you can't put it down! I love all the local references, too- makes the story feel even more realistic. Icing wait to read another book written by Francis. This was the best book I read in 2016! One of the most wonderful books I've read. Auf dieses Buch bin ich durch Nina, Hauptsachebunt aufmerksam geworden. Durch Yovnne, lectureoflive und Janice, lesenist ist es auf dem Stapel der ungelesenen Bücher noch ein Stück weiter nach oben gerutscht und ich habe es nicht bereut. Ich bin regelrecht vernarrt in dieses Buch. Die Geschichte beginnt 1978 als Hallie und Gus gerade neun Jahre alt sind. Sie leben in einem Fischerdorft Provincetown am Cape Cod. Die Atmosphäre des Fischerdorfes und der Zusammenhalt der Gemeinde lässt sich einen so Auf dieses Buch bin ich durch Nina, Hauptsachebunt aufmerksam geworden. Durch Yovnne, lectureoflive und Janice, lesenist ist es auf dem Stapel der ungelesenen Bücher noch ein Stück weiter nach oben gerutscht und ich habe es nicht bereut. Ich bin regelrecht vernarrt in dieses Buch. Die Geschichte beginnt 1978 als Hallie und Gus gerade neun Jahre alt sind. Sie leben in einem Fischerdorft Provincetown am Cape Cod. Die Atmosphäre des Fischerdorfes und der Zusammenhalt der Gemeinde lässt sich einen sofort Wohlfühlen. Am Anfang war ich etwas erschrocken, als ich denn 600 Seiten Schmöker in der Hand hatte. Aber Hallie hat mich mit ihrer Beharrlichkeit, mit welcher sie, als neun jährige um Gus gekämpft hat um den Finger gewickelt. Insgesamt begleiten wir Hallie und Gus über 30 Jahre und verfolgen ihr Schicksal. Wenn jemand keine Geschichten mag, die über mehrere Jahre gehen sollte er die Finger von diesem Buch lassen. Ich hingegen konnte gar nicht genug von Hallie und Gus bekommen. Was als zarte Freundschaft im Kindesalter begann entwickelt sich zu einer Liebesbeziehung im Teenageralter. So hatte ich alles in einem Buch: Gute Freunde, die für einander einstehen, die erste große Liebe, die einzig wahre Liebe, welche eigentlich für ein ganzes Leben halten sollte, tolle Eltern, eine richtige Heimat, das Meer und den Strand, schwere Schicksalsschläge, eine große Tragödie, viel Wut und Trauer auch auf meiner Seite und dann das Ende. Das Ende hat zu dem Buch gepasst, auch wenn ich mir als Leser das vielleicht anders gewünscht hätte, hat es mich doch nicht unzufrieden zurückgelassen. Dennoch kann ich meine Begeisterung für dieses Buch kaum ausdrücken. Es besteht akute Suchtgefahr. Ein weiterer Grund, warum dieses Buch unbedingt bei mir einziehen musste ist das Cover. Zwei Kinder, welche am Strand spielen. Es passt so gut zu der Geschichte des Buches und lädt zum Träumen ein. This review has been hidden because it contains spoilers. To view it, click here. I LOVED the Liar's Diary so I was expecting big things from this new book by Patry Francis. It was a lot different just in terms of the reach of the story, the narration and the ending. I read it in a day - couldn't put it down. There were strange typos in this I LOVED the Liar's Diary so I was expecting big things from this new book by Patry Francis. It was a lot different just in terms of the reach of the story, the narration and the ending. I read it in a day - couldn't put it down. There were strange typos in this book too (an egregiously misused "you're" when it should have been "your") and lack of paragraph splits. But I loved that Francis nailed the narration by Mila. NAILED IT. That to me, as you might know from previous reviews, is a sign of a gifted writer. I liked the overuse of "dumb" and how the writing was much less lyrical. What a complex book! Themes as diverse as a love that can't be denied, the destructive power of hate, anger that devours, abuse that destroys, murder, and the underlying question of a genetic predisposition to violence. Caught up in a twisting, downward spiral are the various characters in this page-turner about a small Portuguese town in New England. Gus, whose father is in prison charged with the murder of Gus' mother; Hallie whose mother died of cancer; Julia, the daughter of the rectory hous What a complex book! Themes as diverse as a love that can't be denied, the destructive power of hate, anger that devours, abuse that destroys, murder, and the underlying question of a genetic predisposition to violence. Caught up in a twisting, downward spiral are the various characters in this page-turner about a small Portuguese town in New England. Gus, whose father is in prison charged with the murder of Gus' mother; Hallie whose mother died of cancer; Julia, the daughter of the rectory housekeeper, calls the priests her dads; David Copperfield, an orphan in a book; Ava, abused by her husband, is concerned about the safety of her daughter, Mila; and Neil, the actor who is putting on the performance of his life. Until the last sentence of the last page of the last chapter, you'll be riveted. Patry Francis has authored this emotional roller coaster ride in The Orphans of Race Point. This is the story of three friends Hallie, Gus, and Neil who all lived in a Portuguese community in Provincetown, Massachusetts. This story centers on the tragedy that changed their lives, their senior prom party held on the beach. I was compelled to keep reading wondering how this story would end. I was profoundly affected by this book. It has not changed how I feel but it has enhanced my true beliefs. Lov Patry Francis has authored this emotional roller coaster ride in The Orphans of Race Point. This is the story of three friends Hallie, Gus, and Neil who all lived in a Portuguese community in Provincetown, Massachusetts. I was profoundly affected by this book. It has not changed how I feel but it has enhanced my true beliefs. Love without holding back, forgive, as you would want to be forgiven, and do no harm to others. 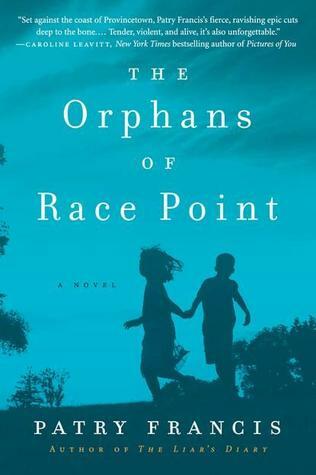 I truly enjoyed reading The Orphans of Race Point and I will recommend it to many others. I both liked this book and was disappointed with it. The story of two young kids who had been through tragedy befriending each other and falling in love with each other should be a good segue into a book that couldn't be put down. But the there is a love triangle, more and more characters. These characters should have given the story more depth, but I found them extraneous and complicated the story. I thought the ending might be more emotionally satisfying. All in all an ok story but too long fo I both liked this book and was disappointed with it. The story of two young kids who had been through tragedy befriending each other and falling in love with each other should be a good segue into a book that couldn't be put down. But the there is a love triangle, more and more characters. These characters should have given the story more depth, but I found them extraneous and complicated the story. I thought the ending might be more emotionally satisfying. All in all an ok story but too long for the amount of satisfaction. I'd really like to give this book two stars but since it's a book club selection I'll be a little more generous. This is the most magnificent novel I’ve read in awhile. I laughed, I cried, I felt heartsick and I rejoiced in the love, despair and compassion shared by the characters. This is literature. The writing is flawless and the deep human truths revealed through wonderful, fully developed characters whisks the reader along on the journey.